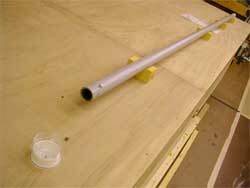 Time to glue together the two lengths of sterntube. From the two lengths of sterntube supplied by Vetus I've chosen to put the center bearing as close to the middle of the propeller shaft while keeping the joint outside the hull. 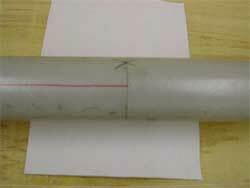 The first challenge was to keep the two pieces of sterntube in line. For this I chose to use V-blocks aligned as shown with a length of string and held in place with 'hot glue' melt. It's a great idea until you discover that the tubes aren't straight! So I aligned them as best I could and tacked the two tubes together with some quick setting epoxy. 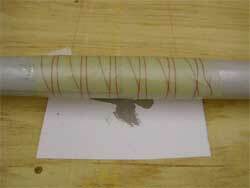 The following weekend I sanded the joint area and wrapped it in a light glass cloth cut 45/45. Followed by a few turns of peel ply to mop up the excess resin.